Orthopedic surgery is an advanced surgical procedure that treats orthopedic injuries (e.g., fractures and luxations) and neurological trauma. At Trinity Pet Hospital, we offer orthopedic surgery by a board certified surgeon. Fixing a ruptured cranial crucial ligament and treating hip dysplasia are two the most common pet orthopedic procedures performed by our veterinarian in Laguna Nigel. Should your pet be in a traumatic accident or suffer an injury that requires immediate intervention, our emergency veterinarian in Laguna Hills also performs emergency orthopedic procedures. Orthopedic surgery treats common conditions including cranial cruciate rupture, degenerative joint disease, canine hip dysplasia, angular limb deformities, inter vertebral disc disease, patella luxation (dislocated knee), and diseases of the elbow and shoulder. Many of these procedures can be performed using minimally invasive techniques, including laparoscopy. Our Board Certified orthopedic surgeon has substantial experience performing these operations and whenever possible opts for a minimally invasive surgical technique. Doing so helps to lower the risk for infection and complications that are often associated with larger surgical incisions. While emergency surgeries are by their very nature a quickly planned event, whenever possible, our veterinarian in Laguna Nigel works closely with pet owners to carefully plan and schedule orthopedic surgeries. We recognized that any surgical procedure, no matter how routine, can be a nerve-wracking experience for pet owners. This is especially true if you are not sure what to expect or how to prepare. Our emergency veterinarian in Laguna Hills will walk you through each step of the procedure, including pre-operative and post-op care. In order to best prepare your pet for surgery, our veterinarian in Laguna Nigel requests that you withhold food 12 hours prior to surgery. For most pets, this means a light dinner the night before and no morning meal. A limited amount of water is acceptable. Restricting food and water intake is essential to reducing the risk for potential anesthesia complications. Following the operation, pets may be groggy the first night home and not seem like themselves. Give your pet space to quietly rest in a small, dark room with access to a small amount of food and water. 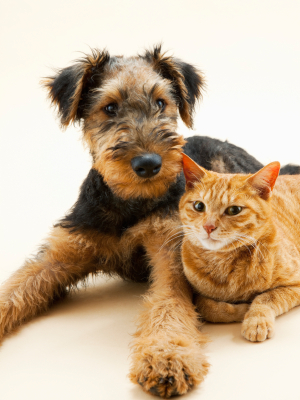 Keep a close eye on your pet and do not allow him or her to lick any incisions. If you see your pet licking the incision, contact our Laguna Hills veterinarian for a cone collar to prevent this. Incision licking slows the healing process and increases the risk for potential infection. Dogs should be leash walked in a small, confined area. Please keep in mind that following orthopedic surgery, your pet may need significant mobility assistance during the first few weeks. Once your pet has sufficiently recovered, our veterinarian in Laguna Nigel will schedule rehabilitative care. One common rehabilitative care option is walking on an underwater treadmill, which helps to rebuild strength and stability. To learn more about orthopedic surgery, including how to prepare your pet and what to expect after the procedure, contact us at 949-232-1788.